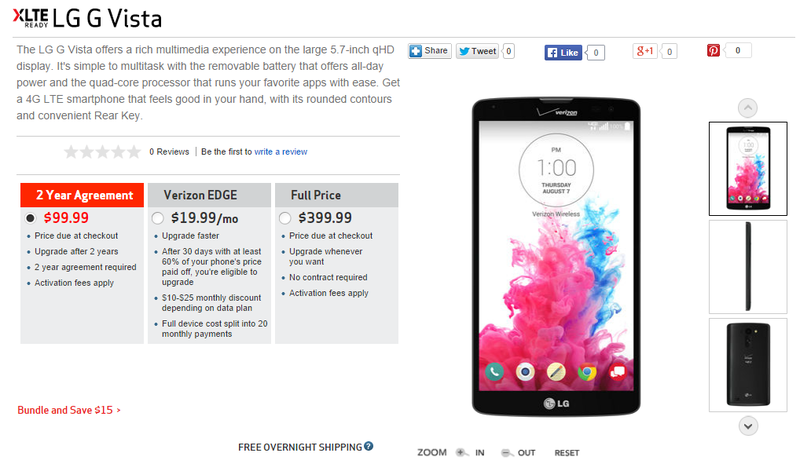 Looking for a mid-range phone on Verizon? Then you've got two more choices starting today. 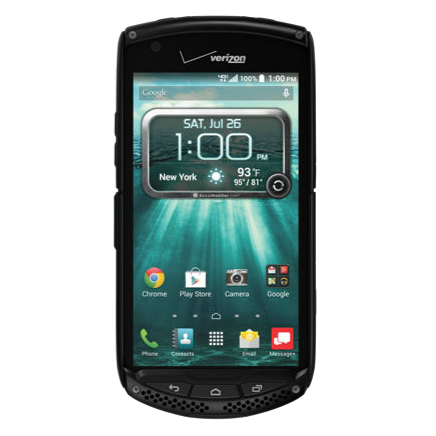 The LG G Vista, an enormous "phablet" device, and the Kyocera Brigadier, the latest in the company's line of "tough" phones, are both on sale now at Verizon's website. They should be in at least some company-owned retailer stores starting Thursday, July 31st. Both phones are being sold for $99.99 on-contract, and both are $400 without a commitment. The aptly-named G Vista uses an enormous 5.7-inch display, matching the Galaxy Note 3 for the largest display in Verizon's current lineup. But since this phone is decidedly mid-range, you'll only get one-quarter of the resolution (960x540). (See update above.) The rest of the phone is on about the same level: 1.2Ghz quad-core processor, 1.5GB of RAM, 8 lonely gigabytes of storage space plus an open MicroSD card slot, and an 8MP rear camera. At least the G Vista looks good, with slim bezels, rear-mounted control buttons, and a basic design similar to the G2. With a 3200mAh battery it should last a while, and it runs LG's customized version of 4.4.2 out of the box. 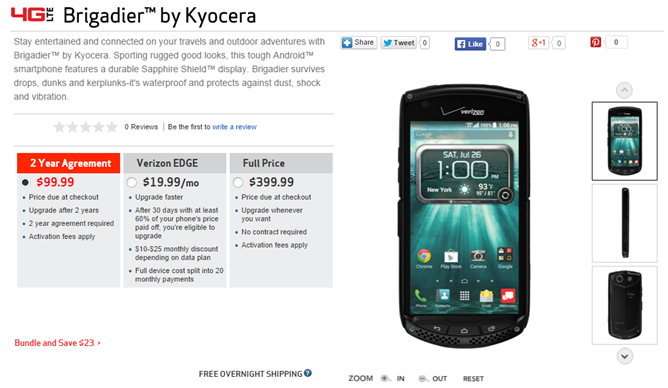 Kyocera's Brigadier, which leaked back in April, is another kettle of fish altogether. The 4.5-inch screen is much smaller, with a higher 720p resolution. That isn't the major selling point, however: this is a "rugged" phone, designed to take a lickin' and keep on using various digital outputs and syncing mechanisms to display the time. For example, that screen is covered in a layer of synthetic sapphire glass, the first we've seen on a US smartphone, and theoretically unscratchable by anything other than diamond. (Don't get too enthusiastic - it can still shatter.) 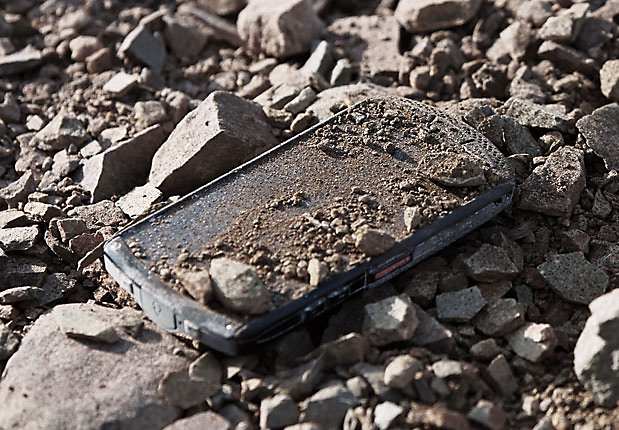 The phone can be used with gloves and in wet conditions, and the chunky body with physical navigation, camera, and speakerphone buttons is rated to Military Standard 801G for dust, shock, temperature, pressure, radiation, humidity, and (wait for it) water resistance. Most of the rest of the specs beat out the G Vista, including a 1.4Ghz Snapdragon 400 processor, 2GB of RAM, 16GB of storage plus a MicroSD card slot, and an 8MP/2MP camera setup. Kyocera highlights impressively loud 100 decibel front-facing speakers, and the 3100mAh battery can be charged wirelessly. Software is Android 4.4. The Brigadier looks like an impressive entry in the admittedly niche rugged segment, while the G Vista is yet another big-screen phone for those on a budget. Any takers?